Just read (p. 253) this beautiful anecdote about an English treasure hunter, one E.F. Knight, and his party, who in the late 19th century spent time on a hell hole of an island, far off the coast of Brazil, called Trinidade, unsuccessfully digging for blingbling: They made trenches, cracked rocks, and began to resemble savages in their torn clothes and roasted skin. After three months they abandoned their quest. They had uncovered nothing and were close to starvation and collapse. And how Mr. E.F. Knight described their mindset during the return journey? We seemed happy enough as we were. If possessed of this hoard our lives would of certainty have become a burden to us. We should be too precious to be comfortable. We should degenerate into miserable, fearsome hypochondriacs, careful of our means of transit, dreadfully anxious about what we ate or drank, miserably cautious about everything. I’ve always admired that insight. And it often times applies. It doesn’t always and by necessity though, so I remain unconvinced this is the ultimate stance to take. Language can be ‘taken over’, as it is a container, its contents can be changed. But I grant that it takes lots of hard work, which requires resources, lots of conceptual clarity to not get off-railed somewhere during the journey, and lots of, well, luck. But let’s get back to framing. And now listen to George Carlin framing the same in a very different way, equally convincing, at least to me. Well, to be honest, for me George wins hands down. But in what sense is the relevant question. Because he is closer to the truth? How could one make that claim? That is a fundamental question that underlies lots of my fancy explorations. And so far it hasn’t stranded me yet on any particular shore of conviction. Our species seems able to figure stuff out regarding the workings of the physical universe, but regarding the more complex matters of living matter, especially ourselves and especially what we do collectively, we don’t seem to progress much in understanding. That basically implies that we’re chimps with enormously increased fire- power. What that means for the survival chances of our species (and many others), and yes, I do not particularly worry about the planet, is all up for grabs. The question is hotly contested between the optimists and the pessimists, but mostly as hopes and fears talk, very little facts, or at least facts that are irrelevant (you know, the past kinda facts, that do not give any guarantee for the future). I’m certainly on the pessimists’ side, but also aware that that is an emotional stance due to my constitutional neurochemistry rather than anything else. 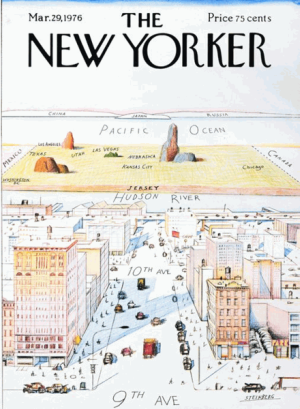 Intellectually that makes me a sucker for we’re-going-down-the-drain narratives, due to the tendency so beautifully illustrated by Saul Steinberg‘s classic 1976 cover of the New Yorker. The me-mapping of confirmation bias is unfortunately inescapable. However, what is ostensibly possible is doubting. Even if it is purely rational, going against your guts convictions, it is a useful tool. In my case, with a pessimistic gut, that would imply being open-minded about the optimists’ hope for technological solutions to (anthropogenic) existential risks (more on those another time), and human inventiveness, adaptability, versatility, plasticity, fill in your preferred optimistic hook, for dealing with the difficult transition periods. It would imply arguing for any policy that buys us more time, because the more we have of that, the larger the chances of the optimists’ hooks effecting their magic. And rationally, those with optimistic guts should draw exactly the same conclusion. But our gut-frames resists such negotiated common ground like the pest. Slippery slopes, doubt goes meta, grant the other a finger(nail)(clipping) and ultimately they’ll take over, and all that. Think about Lakoff: however much I admire his arguments about the need to reframe, to adopt vocabulary that evokes your own – the ‘right’ kinda – frame, rather than argue in the terms of your opposition, I doubt (there you go, can’t switch it off) that fighting frame wars is gonna buy us time. And the meanest subversions are often achieved by playing the other’s game, but slowly and unnoticeably changing the rules. But I also have to admit to doubting those kinda subversions buying us enough time – time’s up, but I’m a pessimist. Our humanverse is all endlessly fascinating, but adding too much fire-power to our tool kit is taking a meltdown risk. Granted, for us, not the earth, as George Carlin rightly points out. Don’t know if that is a consolation. Actually, I do know: it is not. This entry was posted in psychology and tagged confirmation bias, E.F. Knight, environmentalism, Estas Tonne, existential risks, framing, George Carlin, George Lakoff, George Monbiot, metaphors, political analysis, Saul Steinberg, Simon Garfield, social constructionism, The Residents. Bookmark the permalink.